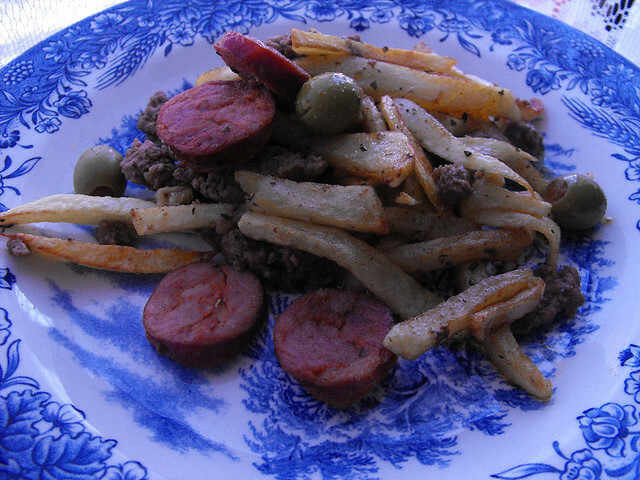 Ground Beef with Linguica and Fries! I love Portuguese food and I love Portuguese cooking, it's all about using the ingredients you have on hand and making substantial filling meals. Your senses are assaulted with the taste of garlic, olive oil and fried onions and let's not for get the wine. With this in mind, I recently received some Linguica from Mello's Chourico, to try out. I remembered seeing a recipe on a portuguese food blog for using up leftover ground beef and I figured this was exactly what I was looking for. 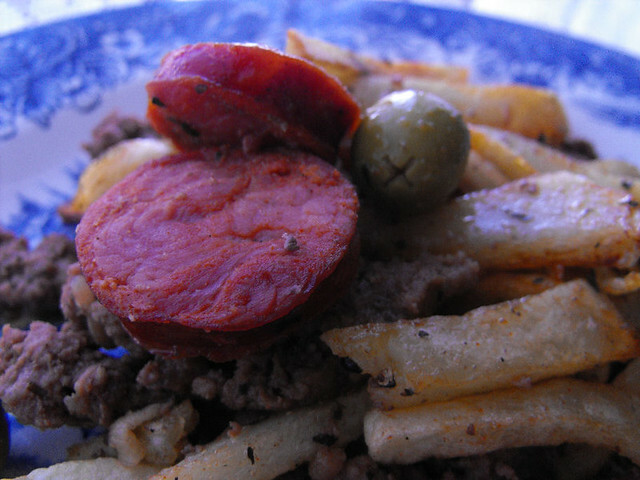 Let me tell you though, the Linguica from Mello's Chourico was SO SO SO good, I'm definitely buying from them soon. 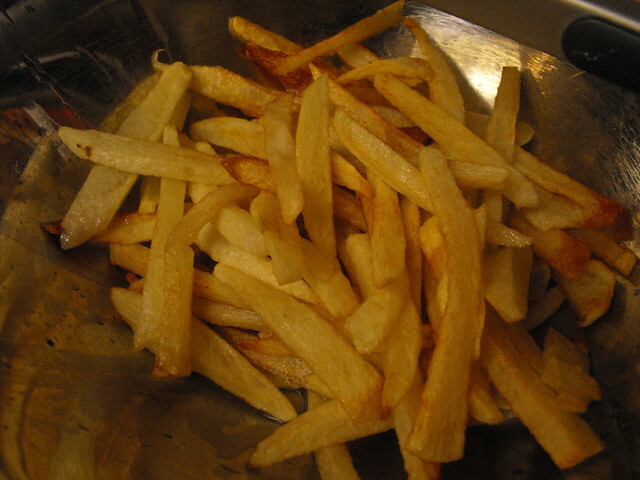 I fried my potatoes in olive oil, you can also use vegetable oil but I prefer the olive oil, it tastes a lot better to me. Reserve. Brown the ground beef with a little bit of olive oil, add the linguica, garlic, salt and pepper, paprika, bay leaf and the mixed herbs. 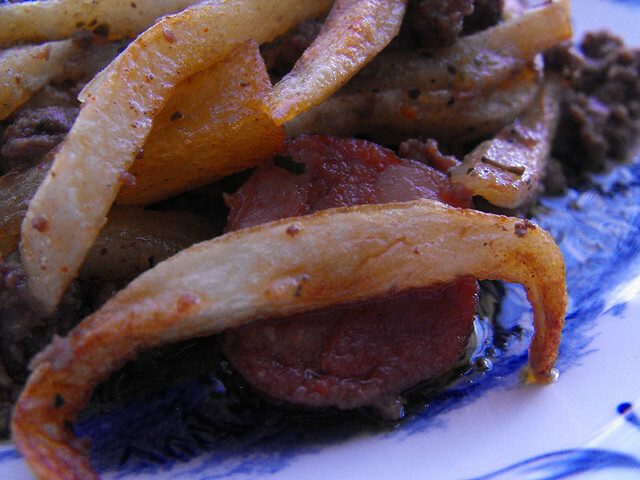 Cook for about 15 minutes then add the homemade fries, stir well. I like adding olives to mine and serving with a salad. Very simple dish but very tasty, my kids love it.